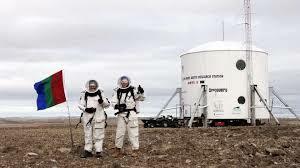 The Mars Society is pleased to announce the release of a new short film entitled “Per Aspera Ad Astra” (“Through Difficulties to the Stars”) that provides a close-up look at the organization’s two long-running Mars surface simulation programs – the Mars Desert Research Station (MDRS) in Utah and the Flashline Mars Arctic Research Station (FMARS) in Canada. The seven-minute film revolves around the recently completed Mars 160 mission, which involved a multi-national crew of eight researchers doing similar science operations for the same period of time (80 days), first at MDRS in 2016 and later at FMARS in 2017. The Mars Society would like to extend special appreciation to the creators of the new film - Jennifer Holt, an Emmy award-winning producer/editor and dedicated Mars advocate, Anastasiya Stepanova, crew journalist for the Mars 160 mission, and James Burk, the Mars Society’s IT Director, along with Dr. Shannon Rupert, the Mars 160 Principal Investigator and overall inspiration for the mission, and the entire Mars 160 crew and support staff. To learn more about the Mars Society and its MDRS-FMARS programs, please visit: www.marssociety.org.